With PC Tools AntiVirus you are protected against the most nefarious cyber-threats attempting to gain access to your PC and personal information. Going online without protection against the latest fast-spreading virus and worms, such as Mytob, Netsky and MyDoom, can result in infections within minutes. That's why PC Tools AntiVirus provides world-leading protection, with rapid database updates, OnGuard real-time protection and comprehensive system scanning to ensure your system remains safe and virus free. PC Tools products are trusted and used by millions of people everyday to protect their home and business computers against online threats. Note: If you want to receive more features (High-speed updates, Dedicated 24/7 support, Phone support), you can register the application through the Buy now link. Why is PC Tools AntiVirus 6.0.0.19 flagged as AdWare? You cannot download any crack or serial number for PC Tools AntiVirus on this page. Every software that you are able to download on our site is legal. There is no crack, serial number, hack or activation key for PC Tools AntiVirus present here. Our collection also doesn't contain any keygens, because keygen programs are being used in illegal ways which we do not support. All software that you can find here is freely downloadable and legal. 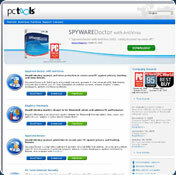 PC Tools AntiVirus installation package is prepared to be downloaded from our fast download servers. It is checked for possible viruses and is proven to be 100% clean and safe. Various leading antiviruses have been used to test PC Tools AntiVirus, if it contains any viruses. No infections have been found and downloading PC Tools AntiVirus is completelly problem free because of that reason. Our experts on malware detection tested PC Tools AntiVirus with various spyware and malware detection programs, including fyxm.net custom malware and spyware detection, and absolutelly no malware or spyware was found in PC Tools AntiVirus. All software that you can find on our servers, including PC Tools AntiVirus, is either freeware, shareware or open-source, some of the software packages are demo, trial or patch versions and if possible (public domain licence), we also host official full versions of software. Because we want to be one of the fastest download sites on the web, we host all the software including PC Tools AntiVirus on our servers. You cannot find here any torrents or download links that would lead you to dangerous sites. Rate PC Tools AntiVirus 6.0.0.19!